Antique 6 Hook Cast Iron & Oak Wall Mount Hat Coat Rack RR School Home Cabin OLD. 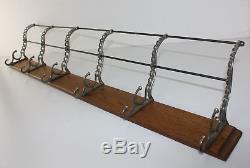 Offered for your consideration is this Antique 6 Hook Cast Iron & Oak Wall Mount Hat & Coat Rack. 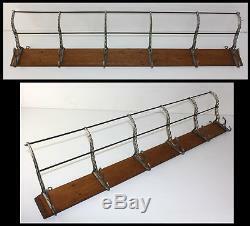 This style of rack was used in the late 1800's in the country schools, but they were also used in businesses & private homes, & also used in railroad depots. They are still considered a handy usable item in today's collectible society. The iron rods used in this hat rack run through the cast iron decorative brackets. Each bracket is properly mortised into the back. There are small holes drilled into this piece that are spaced at 16 apart to easily hit studding's. There are also eyelets to screwed in from the top side to hang it as well. It is in wonderful clean condition. This beauty carries the tapered/beveled oak ends on the sides & it measures 38" long by 7-3/4" high & it stands out from the wall approx 6. We encourage you to view our photos for additional item specifics and condition details Thank you and may GOD Bless the USA, our Beloved Troops & Veterans! We value honesty/credibility/reputation more than any item we might sell. We attach large pictures to show our items clearly & we do not misrepresent our merchandise. Please give us 5 stars if you do not think we deserve it, please let us know why. Our goal is to please all customers. Feel free to call or message us if you have any questions. Listing and template services provided by inkFrog. The item "Antique 6 Hook Cast Iron & Oak Wall Mount Hat Coat Rack RR School Home Cabin OLD" is in sale since Friday, June 29, 2018. This item is in the category "Antiques\Furniture\Hall Trees & Stands\1900-1950". The seller is "jeannesantiques" and is located in Crofton, Nebraska. This item can be shipped to North, South, or Latin America, all countries in Europe, all countries in continental Asia, Australia.